Denpasar is a place where urban modernity and traditional Balinese culture come together for an electric rendezvous. Rugged and charismatic, it is a cosmopolitan metropolis, Bali-style. Denpasar is the capital of Bali and home to an estimated population of over 1 million people. Attractions include the Bajra Sandhi Monument, Desa Budaya Kertalangu Cultural Village and Jagatnatha Temple. Experience a unique fusion of tropical magnetism and feverish urban energy with cheap flights to Denpasar. Denpasar is home to Ngurah Rai International Airport (DPS), which is a 40-minute drive from the heart of the city. The airport serves a multitude of airlines, including Qatar Airways, Emirates and Singapore Airlines. Popular international flights to Denpasar depart from Johannesburg and Cape Town. Flight duration from Johannesburg to Denpasar is approximately 13 hours 50 minutes. 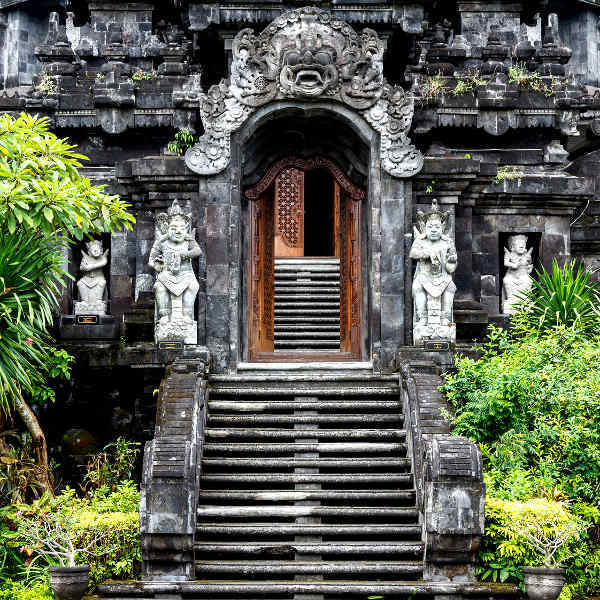 Bali is a deeply spiritual place, and this can be seen in the sheer number of temples dappling the landscape. Notable temples in Denpasar are Pura Jagatnath and Pura Maospahit. Cultural roots in Bali run deep. Balinese culture is a blazing tapestry of bewitching art forms and captivating traditions. The island is known for dance, handicrafts, sculpture, festivals and cuisine. Despite being the heaving urban heart of Bali, Denpasar is not completely untouched by tropical landscapes. Follow the horizon and you will find wild green jungle and glittering turquoise ocean. Denpasar experiences a tropical climate. The climate is characterised by two distinct seasons: wet and dry. 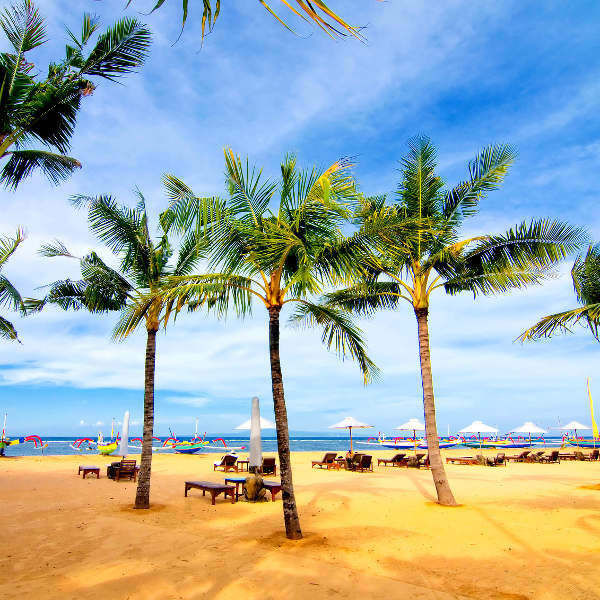 The weather in Denpasar remains hot and humid throughout the year, with average temperatures ranging from 32 degrees Celsius in summer to 24 degrees Celsius in winter. The dry season (April to October) is considered peak season. Clear skies and balmy temperatures offer sensational conditions for lazing on the beach, exploring attractions and enjoying stellar sunsets. 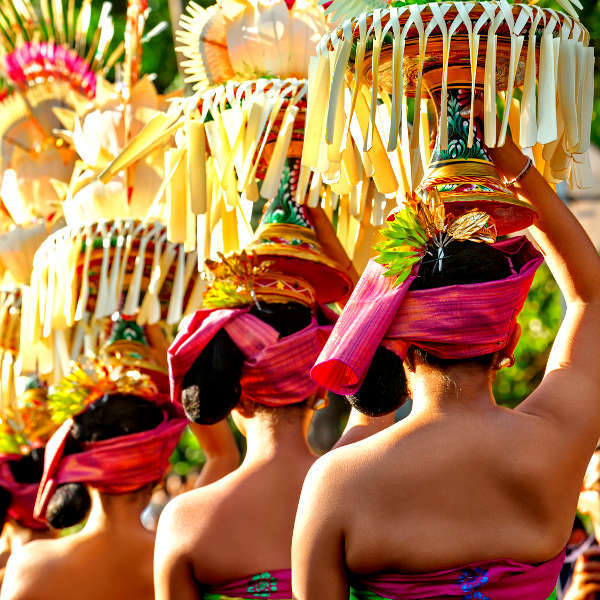 The Bali Arts Festival happens during June and July every year. The wet season settles over the city between October and March. Downpours can be torrential. Although there is no official ‘low season’ Bali, for cheap flights to Denpasar, the best time to visit is before or after Christmas, New Year and school holidays. Denpasar is a strangely magnetic place. Shabby streets that bustle with traditional markets, ojeks and dokars, give way to soft stretches of beach dotted with thatch huts, and wild hillsides overlooking turquoise and sapphire ocean. The urbane quiver of a sprawling metropolis fuses with the easy rusticism of a tropical paradise to create the rugged magnetism that whirs and purrs through the streets of Denpasar. Denpasar invites you to explore sacred temples draped in the divine mysticism of Hinduism; witness the untamed beauty of Suwung Kawuh mangrove forest; indulge in the delectably rare flavours of Kopi Luwak at a local coffee plantation; swim with sharks at Shark Island; luxuriate in the tropical beauty of Sanur Beach; and spoil your palate with tantalising coconut infused betutu. But most importantly, Denpasar invites you to feel the intoxicating energy of a unique Balinese metropolis. Denpasar is feisty, feverish and charismatic. And it is ready to take you on a wild ride of authenticity, culture and colour. Compare several airlines and book your cheap flights to Denpasar online at Travelstart! South African passport holders do not require a visa when travelling to Denpasar, or anywhere else in Indonesia for stays up to 30 days. Ensure your passport has two blank pages for entry stamps and has a validity of at least six months. Leave ample time for processing. The South African Embassy is located in Jakarta. Wisma GKBI, Suite 705, 7th floor Jl. Jend. Sudirman Kav. 28 Jakarta 10210. Phone: +62 21 2991 2500. Although Bali is considered relatively safe, Denpasar is a sprawling capital, so it is advisable to take certain precautions and maintain vigilance at all times. Travel insurance to cover theft and medical expenses is recommended. Avoid flaunting wealth and carrying large sums of cash and valuables. Leave your passport and other important documents in the hotel safe. Carrying a colour copy of your passport with you is recommended. Avoid travelling alone, and through deserted areas at night. Only make use of registered taxis, and agree on a fare before beginning the journey. Proof of yellow fever vaccination is required if you are travelling from a yellow fever endemic area. Denpasar is at risk for Dengue Fever, so travellers should take precautions to avoid being bitten. Immunisation against Hepatitis A & B, typhoid, malaria, and rabies are recommended. Other routine and recommended vaccinations include MMR, diphtheria-tetanus-pertussis, varicella and polio.